I just could not resist the creativity of it. OK, I know I have been running on about berries the last few posts. This is the very last thing I am going to post about pies, or blueberries, or probably even baking this year at the very least. This photo has been going around the internet and I don’t know who to credit it to. But I will say that it is delightful, and I think next year for blueberry season I am going to be making this for my grandkids. Or my kids. Or actually, for myself. Is this cool or what? This entry was posted in kids, Uncategorized, Wow! and tagged baking, berries, grandchildren, Kracken, octopus, pie. Bookmark the permalink. 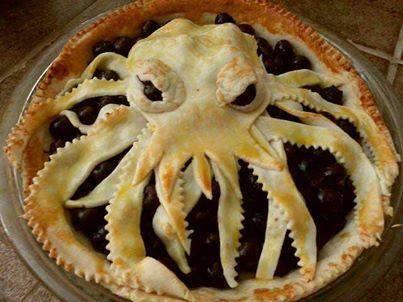 I think it’s supposed to be a Kraken.